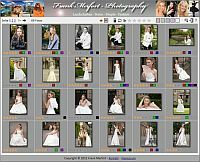 The Stock Photo Manager offers the possibility to optimize and to speed up the stock photo management workflow to photographers. The program supports photographers at the management of photos, the assignment from texts and keywords (if desired in several languages), the upload, the gathering of information, the statistical evaluation and generally the handling with stock photo agencies. The Image Selection Gallery will be installed on a web server and allows a simple selection and rating of images by models or clients. Each gallery is only accessible after previous login.